The most revered figure in the Kabbalistic World, next to Rabbi Shimon Bar Yochai, is Rabbi Isaac Luria, The ARI. Known as "The Lion", the ARI arrived in Tzfat in the mid-16th century and his presence, in addition to the developments that he brought to the study of Kabbalah, assured that Tzfat would forever more be known as the "City of Kabbalah" throughout the Jewish World. The ARI was already a revered Torah scholar when he arrived in Tzfat. His custom was to sit in a small cave in the Elijah HaNavi synagogue (today the ARI Sepharadi synagogue) and learn new insights into Kabbalistic thought while studying with Elijah the Prophet. Jews believe that God gave the Torah to the Children of Israel on Mount Sinai. Religious Jews believe that the Torah is God's Word, both in its recitation of the origins of the Jewish people and the commandments that God expects the Jews to keep. A simple reading of these Five Books of Moses spells out the early years of the world and of the Jewish religion, from Adam and Eve through Noah and the Flood, Abraham, Isaac and Jacob, Joseph's descent into Egypt, the Children of Israel's years of slavery, and their Exodus from Egypt and travels towards the Land of Israel. But Kabbalist thought brings one to a deeper level of understanding of what God is telling us in the Torah. It encourages one to explore the true essence of God, and the ARI further refined this study to encourage us to explore how we can strengthen our relationship with God and with our fellow man through understanding God's attributes, how He has created the world, and the various elements that He left in the world for us to understand. Paths connect the Sephirot to each other, and represent our subjective experiences as we move from one state or condition to another. The ARI brought the study of reincarnation into Jewish consciousness, as well as the idea of how a soul rectifies some lacking or mistake from its life on earth in order to be released from the earth and continue on to its reward in heaven. He was also involved in traveling around the North, marking gravesites of scholars and Jewish leaders who died thousands of years ago - those graves are sites for pilgrims today to gather and pray. Included is the gravesite of Rabbi Shimon Bar Yochai at Mt. Meron, who is believed to have written the Book of Zohar, the base for studying Kabbalah, in the 1st century A.D. 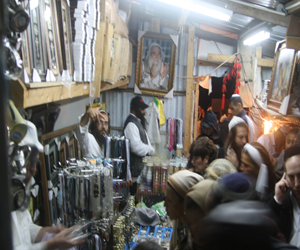 Many Jewish customs and traditions which are today celebrated throughout the Jewish world by Ashkanazi and Sepharadi communities alike began in Tzfat with the ARI's leadership - Kabbalat Shabbat service, the Tu B'shevat Seder, the Lag B'Omer pilgrimage to Rabbi Bar Yochai's gravesite, and many others. The teachings of the ARI had a tremendous effect on the development of the Hassidic movement, and Hassidim revere him - on his Yartzeit, anniversary of his death, every year, tens of thousands of Hassidim flock to his gravesite to pay their respects. The ARI lived in Tzfat for 3 years, but his legacy has lasted almost 500 years, and strengthens with time.